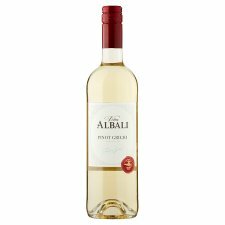 A delicious crisp white with light floral aromas and fresh citrus flavours in the mouth. Enjoy chilled with chicken, seafood, fish or salads. From the classic vineyards of Italy, growers use modern growing methods and systems in the vineyard and for wine making. While most of the traditional wines from this area are based on native grape varieties, high demand for international varietals in the European and US markets has galvanized the region's producers into production of grapes such as Pinot Grigio. Félix Solís SL winery was founded in April 1975 and lies along the current national road that links Madrid to Cadiz. The winery is one of the largest family-owned wineries in the world and is fitted with the most modern production and storage facilities. The World Ranking of Wines and Spirits (WRWS) gave Felix Solis sixth place in the top 100 Best Wineries of the World and second place in the category ‘Best Wineries of Spain'. Much of the harvest is done at night to guarantee temperatures of below 12ºC to ensure the maximum potential of the Pinot Grigio grape. Every step of the winemaking process includes careful handling so that oxidation of the juice and wine is avoided. Maceration with the skins is carried out at a low temperature. The fermentation takes place at approximately 14-16 ºC for up to 12-15 days, in order to obtain the maximum aromatic potential.